Dean John Boyer, AM’69, PhD’75, tells the story behind his new book, The University of Chicago: A History. 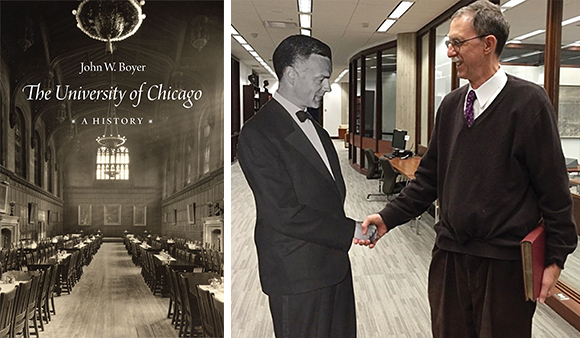 John W. Boyer, AM’69, PhD’75, dean of the College since 1992, published The University of Chicago: A History with the University of Chicago Press in October 2015. Here, an inside look at some of his favorite stories from the University’s 125 years. The first chapter is about the first University of Chicago, the one that failed. Some people asked, “Why did you start your book on such a depressing note?” Well, our university would not have been born except for the failure of the first. The leaders were filled with shame and embarrassment. They wanted a second chance, and they knew they weren’t going to get a third. The grand narrative is that we started great and became greater. And the University’s story is not like that at all. It’s a story of complexity, endless challenges, endless crises. One of those crises was the attack on the University in 1935 by the Illinois legislature. Charles Walgreen was the founder of the Walgreens empire. His niece, Lucille Norton [EX’35], who was living with him, came home one day and mentioned that she was studying The Communist Manifesto, and Walgreen became outraged. I think she was teasing him, but he took literally her attempt to get a rise out of him. One thing led to another. The University was investigated by the Illinois Senate and the Hearst press picked it up. The whole thing ended up being a circus. I remember reading these transcripts of the hearings, sitting in the archives laughing because it was like a theater of the absurd. More recently, the story of the University over the last 50 years is the story of trying to retain our high academic standards but also create a more inviting atmosphere for students, which we have done. The University was trying to recruit students who had a real appetite for scholarship and learning, which was fine. The problem was that they didn’t realize young people also needed things like swimming pools and recreational facilities. It’s not that the University was opposed to these things, but that they paid little attention to them. Then, starting in the 1950s, you got this image of the College as somewhere “where fun comes to die,” and it hurt the place. The applicant pool became very small. Was that description fair? No. As I point out in the book, the College then was also the site of extraordinary creativity, with the Compass Players, for example. There was a lot of vibrancy, but it was masked by this idea that the College only wanted people who read Aristotle on Sunday mornings. It was a communications disaster of the first order. Anyway, the idea of “where fun comes to die” is a silly statement that has no relevancy now. It’s a vibrant College, where kids enjoy themselves tremendously. I’m now writing a history of Austria and having great fun doing that. There are many parallels between the Habsburg Empire and the University of Chicago, and I’ll leave that as a teaser. You’ll have to read my next book to find out more.